When a special occasion is on the horizon, like a birthday, or Christmas, it can break us out in cold sweat. After all, getting gifts for people is difficult at the best of times. What do you do when there's someone that you want to buy something to mark an occasion, but they are the type of person that says “I don't need anything?” Or, they are someone that never wants anything for their birthday anyway? It's very frustrating because you want to mark the occasion in some way, and a gift is usually a good way to do this. Let's see if we can provide some solutions. There are sites like Gifts for Mum that provides you with an abundance of choices. In one respect, this is great, but if you've got too many options to choose from, it can be difficult to whittle down to one perfect gift. So instead, if you are struggling to buy the perfect gift for someone like this, perhaps going for the gift basket approach can help? After all, if they like food, a gift basket is a very simple and effective option. But, from there, you can get inspiration for other types of gifts. If there's someone that doesn't have the opportunity to go out much, buying them in the experience of sorts can be very thoughtful. Blocking out a calendar day, and giving them an abundance of spa treatments, or getting their hair done, or just giving them that chance to do nothing for the day could be the perfect gift. If there's someone that actually has everything, an experience is a great option. What an experience does is give them an abundance of gifts in one unique package. It's not about material goods. Instead, it's about giving them that opportunity to relax in different surroundings, and to try something new. It's a very common approach that people are trying to communicate to their kids these days, that an experience is far more beneficial. And on the plus side, it stops us flooding the house with goods! If the person you're buying for doesn't have much in the way of material goods, or they've got a very prim and proper house, giving them a present may not mean it takes pride of place anyway. Do you spend much quality time with them? If not, this could very well be an avenue to go down. When it's someone that you don't see a lot, that gift of quality time with them can feel more beneficial than any material item. While the right book has a lot going for it, it is a very little gift. 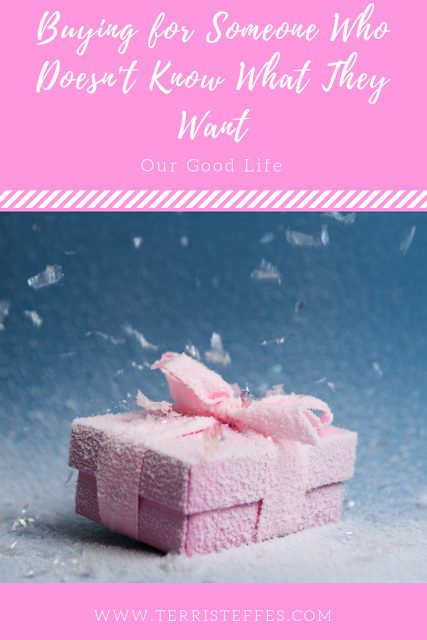 Giving them the gift of your time, especially if you've not been spending time together recently, means that you take the relationship seriously, whether it's parent and child, friends or lovers, these little gifts are all about the thought you put into them. What about you? Do you have some special ideas for gifting those who are hard to buy for? Please share! My sons always call their sister to get ideas for both of us. She always seems to listen and pick up on what we need or say in passing. If I'm at a loss, I just go with a gift card. I know I appreciate them! I also check on Etsy. There are so many unique gift ideas there. I'm going to have to check out gifts for mom because my mom is so picky and has everything. I'm already trying to figure out what to get her for Mother's day. Being able to find a unique gift that she doesn't already have would be fantastic. My kids say that I'm the person hard to buy for. I always tell them I don't need anything and to spend the money on their kids. :) They roll their eyes and usually give me an experience type gift and I always enjoy it. I would want any of these for myself. I would love to gift someone an experience though. I think it's such a great gift idea. My husband is so tough to shop for because he does not need anything so he says. I think the experience idea is a good one for him. I have far too many hard to shop for people and married a man that seemingly wants nothing but his family to be happy. I agree quality time is key. When buying an experience be sure to include yourself else the hard to shop for people might not even go! I know a lot of people who are hard to shop for. My mother in law is one of them. We usually get her something consumable, like food or a nice candle. These are some great tips - I have to admit I am always the person who doesn't know what they want. So I'll have to share this post when someones asking me lol.. I've found that they best way to buy someone a gift, is to pay attention to them throughout the year. Most people will tell you what they enjoy, what they need or what they want. I am always having a hard time in buying gifts for someone most especially with my loved ones. I rather choose to cook their favorite dish instead of wasting my time in finding the best gift for them. Buying a gift for someone who doesn't know what he or she wants is definitely, the hardest thing! I am so glad that nowadays you can find a lot of interesting things on-line! This are great suggestions! I love doing experiences. I have a number of hard to buy for people in my family and experiences are always a hit! Plus, no clutter! My husband is the most difficult person to give gifts too. I always find a hard time finding one that he would like. I love looking on Etsy or the homemade area of Amazon. They always have great ideas for gifts. I like the idea of giving them experience. It would be hard to say NO to things like spa and relaxation. I love the idea of giving someone an experience! I feel like most people buy whatever they want but giving them ticket to a fun show or the zoo would be so much more fun!